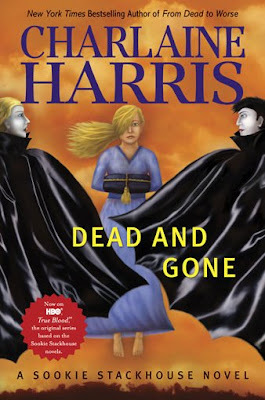 Well now that True Blood is over for the season we have to wait until May 5, 2009 for our next dose of Sookie when the ninth book in the series Dead and Gone hits the shelves. Apparently there is also a Sookie short story in the Unusual Suspects anthology which came out today. Here is the cover of the newest Sookie book from the Charlaine Harris website. Not sure if it is the final art or not, I've not noticed it posted anywhere else although I might have missed it. Oooooh. I love Charlaine Harris. I'm going to start begging the publisher for the book right now. i love Harris's books and have some of this series of covers but they don't appeal to me particularly. I get the books in spite of them rather than because of them. What's the lowdown on these books? I am in desperate need of "smart, sassy, and funny" books for my wife, who has plowed through the normal series she reads. All the better if its something I might be interested in as well! I want to say it's the final art since it's also posted on her website. Geek Monkey - This is a great series if you haven't read it yet. If you're wife has plowed through these novels, she might be interested in Kimberly Raye's Dead End Dating series or Gerry Bartlett's Glory St. Clair series. Hagelrat illustration style isn't always popular but her books are uniquely branded and distinctive. Chris the Sookie books are one of fav series right up there with Kim Harrison' Hollows and Laurell K. Hamilton's Anita Blake. The books are indeed sassy and fun. I believe Amazon has a boxed set deal on the first 7 books that would make an ideal gift. Oh Jackie, yours was the first site I checked to look for the cover art which is why I went to Charlaine's website. You had it listed in New Releases, but it completely slipped by me where you had it placed further down the page. They gave me the last one.... Actually, Charlaine herself got me hooked-up with Penguin books. Very nice lady. Oh I so hope Sookie chooses Eric. I doubt I'll ever forgive Bill. I'm for Eric too, but I think Bill gets too much poor press. I think his big mistake wasn't so much that he originally met Sookie under false pretenses but that he never told her that once he truly loved her before she found out on her own. She has to forgive Bill, because he is the only one who truly loves and understands her.